Hurricane Harvey caused substantial disruptions to crude oil and petroleum product supply chains and increased petroleum product prices. 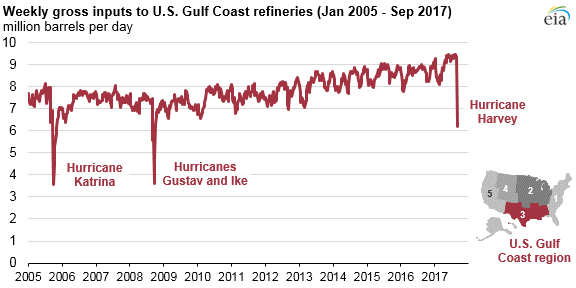 For the week ending September 1, 2017, gross inputs to refineries in the U.S. Gulf Coast fell by 3.2 million b/d, or 34%, from the previous week, the largest drop since Hurricanes Gustav and Ike in 2008. Weekly refinery utilization in the region fell from 96% to 63%, while other areas of the country remained virtually unchanged. 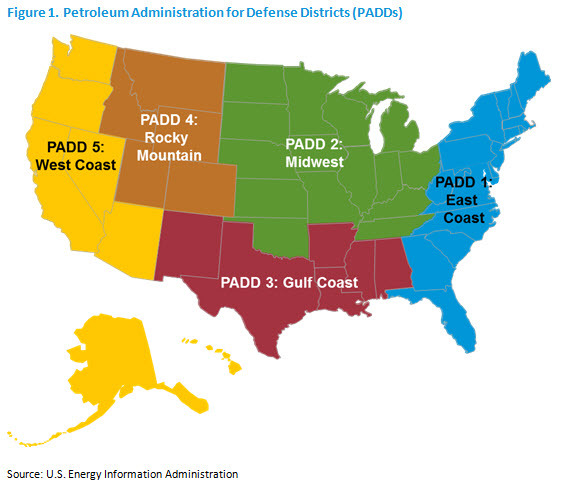 Just over half of all U.S. refinery capacity is located in the U.S. Gulf Coast (defined as Petroleum Administration for Defense District 3). Texas, where Harvey made landfall, represents 31% of all U.S. refinery capacity, based on data from January 2017. These refineries supply petroleum products to domestic markets on the Gulf Coast, East Coast, and Midwest, as well as to international markets. The Gulf Coast region is also a key storage area for crude oil and petroleum products. As of March 2017, 49% of total U.S. working crude oil storage capacity and more than 40% of working storage capacity for both motor gasoline and diesel fuel were located in the Gulf Coast region. Refinery operations are largely dependent on a supply of crude oil and feedstocks, electricity, safe working conditions, workforce availability, and outlets for production. As a result of Hurricane Harvey, many refineries in the region either reduced runs or shut down in its aftermath. Many crude oil and petroleum product pipelines were also affected by the hurricane, including the Colonial Pipeline system. Colonial connects 29 refineries and 267 distribution terminals and carries up to 2.5 million b/d of gasoline, diesel, and jet fuel from Houston to as far north as New York Harbor. Colonial typically operates at or near full capacity, but as a result of Hurricane Harvey and the decreased supply of petroleum products available to ship, Colonial Pipeline briefly curtailed operations and shipped products intermittently before resuming operations at reduced rates of flow on September 6. As supplies were disrupted, the East Coast drew down inventories of motor gasoline. East Coast total motor gasoline inventories in the week ending September 1, 2017 fell by 2.2 million barrels, or 3.5%, compared with the previous week. Almost all of this drawdown occurred in the Lower Atlantic region, which stretches from Virginia to Florida. This weekly drop in inventories was smaller than the drop that occurred following a previous outage of the Colonial Pipeline in September 2016, when Lower Atlantic gasoline inventories fell by nearly 6 million barrels. Disruptions caused by the hurricane also led to higher gasoline prices. The U.S. average regular retail gasoline price increased 28 cents per gallon (gal), from $2.40/gal on August 28, 2017 to $2.68/gal on September 4, based on weekly data collected in EIA’s Gasoline and Diesel Fuel Update. In the areas affected by the hurricane, gasoline prices rose even more, but they still remained below the national average. 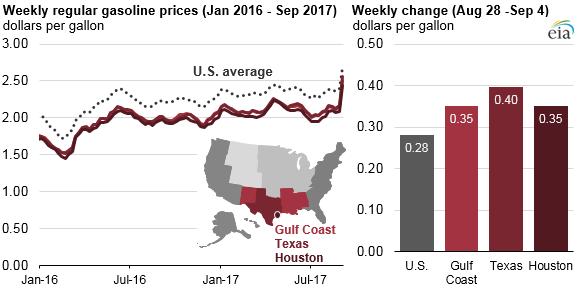 Gulf Coast gasoline prices rose by 35 cents per gallon to $2.51/gal, Texas state average prices rose 40 cents per gallon to $2.56/gal, and Houston prices rose by 35 cents per gallon to $2.43/gal from August 28 to September 4. In each case (United States, Gulf Coast, Texas, and Houston), these were the largest weekly increases in gasoline prices since Hurricane Katrina in 2005.